This video is suppose to help your children by copying what the kids on the video are eating. There are a total of twelve different chapters on fruits and vegetables, and those include: bell peppers, carrots, raspberries, broccoli, bananas, strawberries, tomatoes, cucumbers, oranges, avocados, apples, and blueberries. Broccoli and bananas are about the only foods from the video that my children won't eat. They used to love bananas when they were younger, but now that they are growing, they won't eat them anymore. I haven't tried avocados with them yet. The first chapter is on bell peppers. My daughters, Mercades and Tesla, were laughing along with some of the kids from the video. The kids on the video were enjoying eating bell peppers raw. My daughters actually really love bell peppers. Since my daughters don't like bananas, I decided to put the banana chapter on. I sat them down with a banana, and turned the video to the chapter about bananas. Can you believe they actually ate the banana! Mercades even asked for more. I plan to have my children watch this video a few times a week. I would really love it if my daughters would eat more of a variety of fruits and vegetables. Overall I would recommend this video to anyone with children, especially if they don't like many fruits and vegetables. Copy Kids has won two children's excellence awards including one from Dr. Toy and one from MACT. They were also approved by the USDA and added to their Education and Training Materials Database for preschool nutrition. 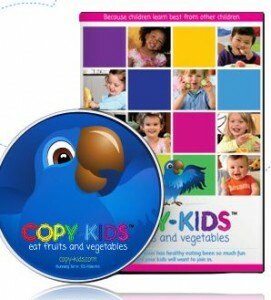 If you would like your kids to eat more fruits and vegetables, why not order a copy of the Copy Kids Dvd today. Also make sure to check them out on Facebook, Twitter, and Pinterest. Disclosure: I wanted to give you 2 chances to win this DVD so I posted a review for another blogger and a review from myself. I received no compensation for this post. I son does not like any kind of melons.